A BURNING CANDLE CAN REALLY COZY A HOUSE UP, ESPECIALLY DURING THE WINTER MONTHS. LEARN HOW TO MAKE THE EASIEST BEESWAX CANDLES WITH THIS VIDEO TUTORIAL AND THESE SIMPLE WRITTEN INSTRUCTIONS. I used to burn candles all the time. Then I came across an article about the toxins found in the wax and wicks. Well, there went that and all the candles! My husband always gets nervous when I’m up googling, because usually it results in something else in our home being unhealthy. 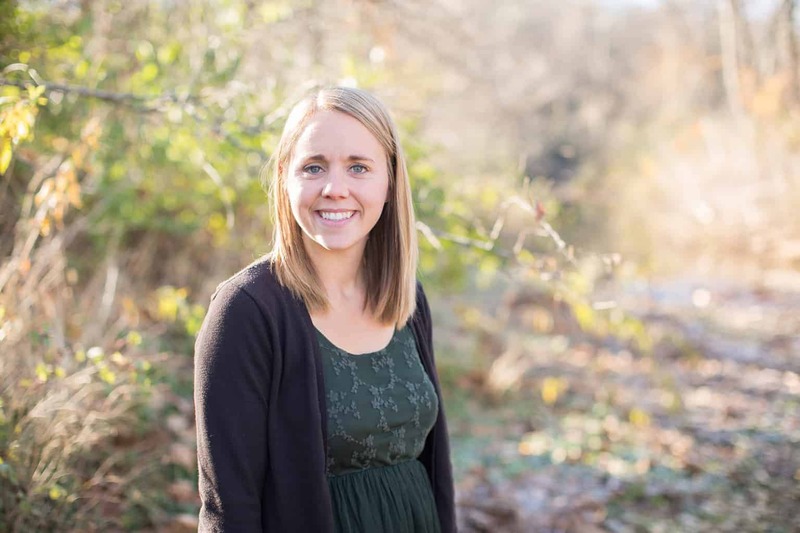 No, we can’t be perfect and we definitely don’t have a perfectly toxic free home. But I am going to try my best! Most the time I just run the diffusers to get the scent I want, but having a candle burning just adds an extra cozy touch. Don’t let candle making overwhelm you, as it did me for a long time, because it is actually a very simple process. Pour the beeswax into a metal pitcher or old coffee can. I suggest using a metal container that you can throw away when you are done, because it is next to impossible to clean beeswax out of dishes. I am using an old popcorn tin. Place the metal container into a large pot of water and bring to a boil. This is your double boiler! Turn heat down to medium and stir occasionally until all the beeswax is melted. Be sure that the water doesn’t splash into the beeswax container. Add in 30-50 drops of essential oils of choice if you want to make a scented candle. This is optional. 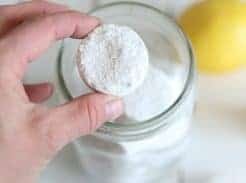 Secure a wick at the bottom of the mason jar with a little glue and then fill the jar with the melted wax and coconut oil. Leave about an inch of room at the top of the jar. Once the wax is completely hardened you can trim the wick and it is ready to lite. It is best for it to be about 1/2 inch long. If you are making candles to scent your house it is going to take a lot of essential oils. It would be more cost effective to use a diffuser if you are trying to get a certain aroma to fill the home. 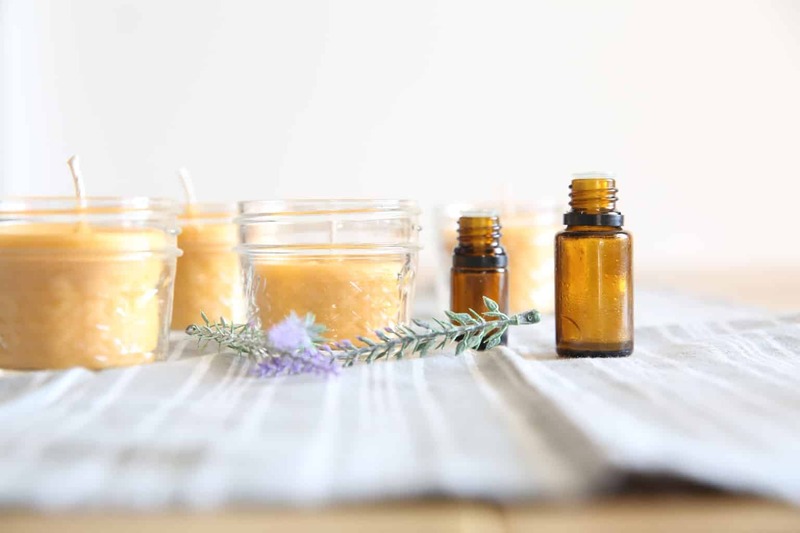 You can use essential oils in your candles and they do let off a scent, but you will have to add about 30-50 drops of essential oils per candle. I personally rather not use that much essential oil in a candle, and instead add 4-6 drops to a diffuser. The trick is to add the essential oils when the wax is still hot and not hardened, but not so hot that the essential oils evaporate. Remove from heat and allow to cool slightly before adding the essential oils and then stir them in. I prefer to light a unscented candle for the cozy feel and run my diffuser to get the scent. This allows you to get more of the aromatic benefits and still gives you a nice smelling, cozy home. Not all store bought candles are bad, however most are filled with toxins. Candles can contain toxic chemicals in the wax and wicks. When they are being burned these toxins are being released into your home and polluting the air. Most candles are made with paraffin wax, which creates highly toxic chemicals that are known carcinogens when burned. 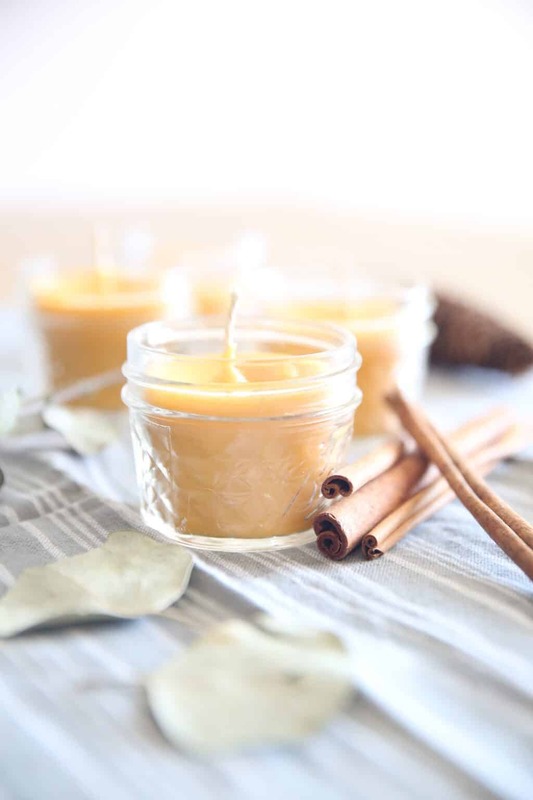 To maintain better air quality within the home consider making homemade candles or using an essential oil diffuser. If you have ever made anything with beeswax before you know how hard it can be to clean off of dishes. 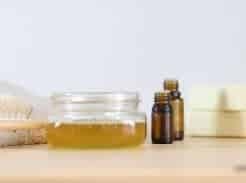 I use beeswax in my homemade lip balm and sunscreen. Try to use the least about of dishes as possible and if you can it is best to use things that can be thrown away. Or saved for all your beeswax DIYs. 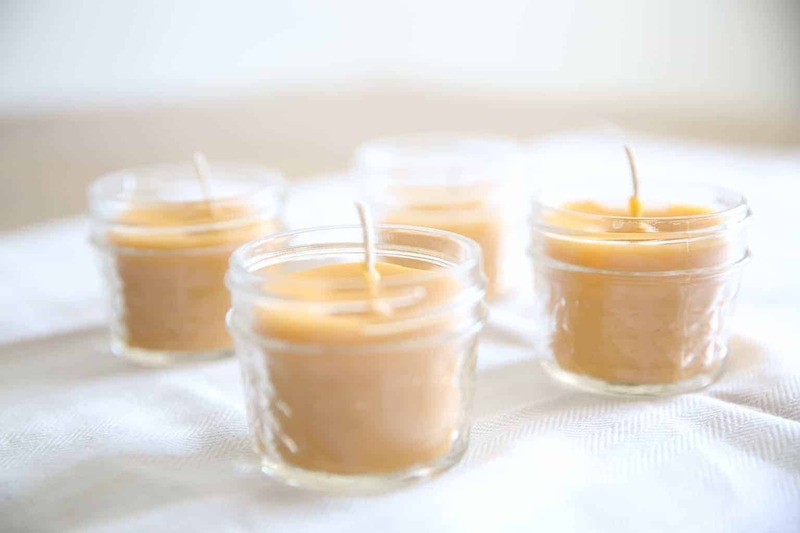 You can make these candles in a crockpot by putting the wax straight in the jars and letting them warm up in the crock pot to melt the wax. This is a great option if you don’t have a throw away metal container to use. When you go to lite your candle for the first time, if the wick is sparking or smoking just blow it out and recut your wick. If it is much shorter than 1/2 inch it will cause the candle to burn down in a tunnel shape. Get creative and use old coffee mugs or little cute vintage containers as your base. Anything that is heat resistance can make a cute candle holder. 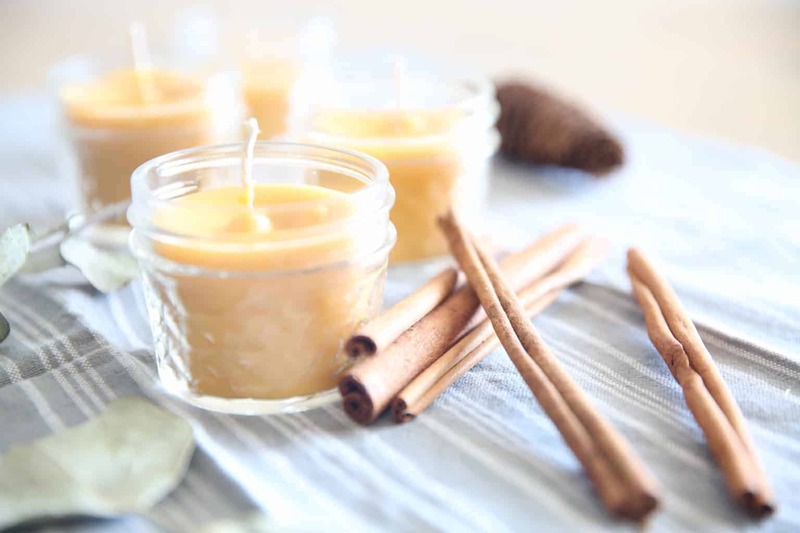 Have you ever made your own homemade candles? Did you scent them? 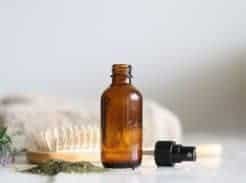 Which essential oils did you use and like most? Share with us in the comments below! I very pleased to find this web site on bing, just what I was looking for : D likewise saved to my bookmarks. Thank you! Glad you are here and enjoying my content! That’s such a great trick with the coconut oil! I would have never guessed it and will definitely try that next time I make a candle cause I burn through them quickly as well. Thanks for sharing!